Startup Wave in the Jaat Land! We met the Manav Rachna academic team, Dr Umesh Dutta and Dr Bindu , at the 11th August MEITY – IESA workshop on the Iesa Innovation Initiative roll out. And – on Prof Umesh’s invitation – I visited Manav Rachna University earlier last week. The visit was an eye-opener on the emerging talent and startup wave in India. I had always been curious about the smart front façade of the University when I used to drive past it ( at least half-a-dozen times) every month. The visit started with a handshake with Dr Gill, the Founder Director for the IOT Incubation Centre. Dr Umesh took me around the IoT Lab – there were interesting innovations from the entrance to every corner. Some were standard ‘ Net plugs’ with feature variations over what we have seen elsewhere – others were more radical and enduser oriented solutions to practical day-to-day needs. We went around the campus – it was pretty much a modern campus with its discussion niches, vibrant and colorful library – and young student energy permeating thru the campus. 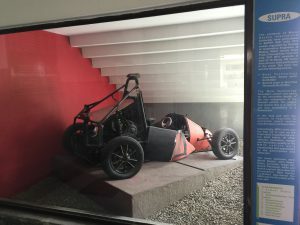 I liked the makers area with basic machining tools – tools that were used by the students to put together electric vehicles for various contests – and showcased at the institute entrance. I noted( with interest) the solar lab – and do believe that it was a good maiden effort – and noted a few practical areas that we could intervene and enhance for the institute. However, for solar power electronics, and theoretical basics, I think Sukam supported lab has the basics. 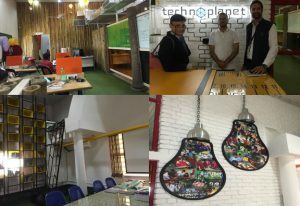 But what clearly took the cake was a startup Umesh mentioned as I was about to leave – and on an impulse, I decided to taste the institute’s recommended startup. Techno Planet vibrancy is captured in the cameo below. 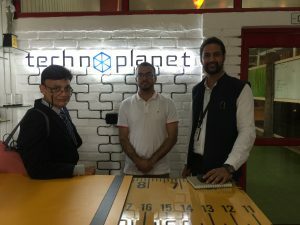 It shows Dr Umesh and Mohit – the founder – with me at the TechnoPlanet reception. Take a look at the bed in the conference room-library – tucked in a niche reached by a ladder! And the colorful interiors. The neat, cheerful work areas – with 3D printers, well arranged spares,small teams working on projects tell a story…. Thumbs up to Manav Rachna faculty for their humble attitude to a fascinating start to their startup journey! !